Banning junk food adverts before the watershed will only cut two calories from a child's diet a day, research shows. The Government revealed plans in March to restrict advertising of foods high in salt, fat, and sugar on television and social media until after 9pm. 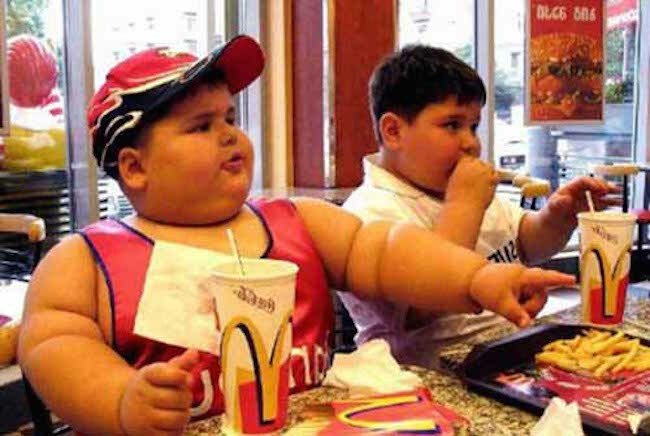 They hoped the strict rules would curb soaring childhood obesity rates, which are already at a record high in Britain. But its own research now shows the measures would barely make a difference to a child's diet, contrary to previous estimates by health campaigners. One in three children are overweight or obese by the time they leave primary school, national statistics show, leaving health officials grappling for solutions. Consultation on the latest phase of the childhood obesity strategy is currently underway. But enforcement of all proposed measures would save 19 calories a day in total, the equivalent of a tenth of a Cadbury Creme Egg, according to The Sun. Stopping companies promoting their products between 9pm and 5.30am would only shave 2.28 calories a day off a child's diet, less than half a smartie. Health ministers have also consulted on plans to ban shops offering buy-one-get-one-free deals on junk food and free refills on sugary drinks. But this would only cut eight calories a day, or less than one Malteser, from a child's diet a day, an assessment by the Department of Health has revealed. Fewer than two Skittles, nine calories, would be shaved off by banning the placement of unhealthy food near tills and shop entrances. The advertising industry has said the small numbers are 'a drop in the ocean' and recognize more efforts must be made to change children's lifestyles. The figures are a stark contrast to what has previously been estimated by Cancer Research UK, who is among those that have been calling for advertising of unhealthy foods to be banned before the 9pm watershed. Last year, the charity said that watching one extra junk food advertisement a week beyond the average of six leads to children eating an additional 350 calories a week - the equivalent of two packets of crisps. That would amount to 18,000 calories a year, which it was estimated to equate to around 70 Mars bars or 60 cheeseburgers. It could amount to a 5lb weight gain annually. Exposure to food advertising can have both an immediate and longer-term impact on children's health by encouraging them to eat both straight after seeing the advert and altering their food preferences, the charity found. Considering children are spending up to 14 hours a week watching TV, and an increasing amount of time online, the ban on adverts has been suggested to make a significant impact. In 2017, kids were estimated to have been exposed to more than 700million ads for unhealthy foods online and almost 3.6billion on TV. Junk food ads during kids' telly shows were banned in 2007, but figures show children spend 64 percent of their TV viewing time watching programmes that are not aimed specifically at them. Under current regulations, ads for high fat, salt, and sugar (HFSS) products must not be directed at children, and no medium should be used to advertise such products if more than 25 percent of its audience was under 16. However, The Obesity Health Alliance (OHA) said the rules fail to cover the 'vast array of channels and outlets through which children consume media in 2019'. They added that the watershed on all junk food adverts is 'desperately needed' to protect children. But the Government's move to ban junk food advertising pre-watershed has had a mixed response elsewhere. Broadcasters, who have resisted the ban, warned that the plans for a watershed on junk food advertising risk doing permanent damage to the industry, the Daily Telegraph said. It added that a coalition of television companies including ITV, Sky and Viacom, the owner of Channel 5, has been fighting the move to outlaw advertising for products that are high in fat, sugar or salt before 9pm. A YouGov survey for the OHA taken this month suggests that 69 percent of people agree that children seeing junk food marketing contribute to childhood obesity. Some 72 percent of people support a 9pm watershed on junk food adverts during popular family TV shows, 70 percent support a 9pm watershed on junk food adverts online and 68 percent want to see a 9pm watershed on junk food adverts on digital advertising outside of the home, including cinemas and digital posters at bus stops or on roadsides, according to the poll.